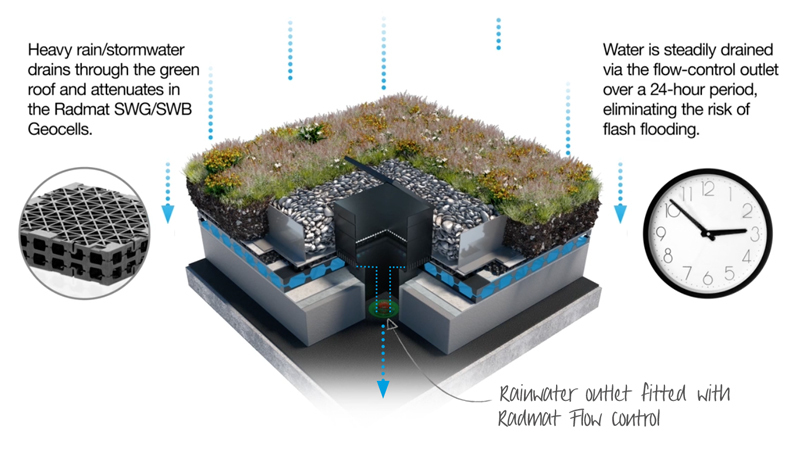 The Radmat range of SWB Blue Roof Geocells provides attenuation as part of a Blue Roof system that is designed to manage and control incident rainfall at a rate in line with the SuDS strategy or the attenuation requirements for a development. 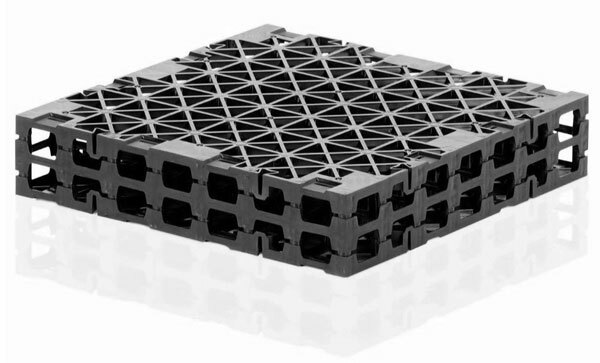 Manufactured from Polypropylene SWB Blue Roof Geocells are load bearing modular units that are clipped together to form a single or double layer attenuation cell that is wrapped in Radmat G12 Geotextile Filter Fleece. 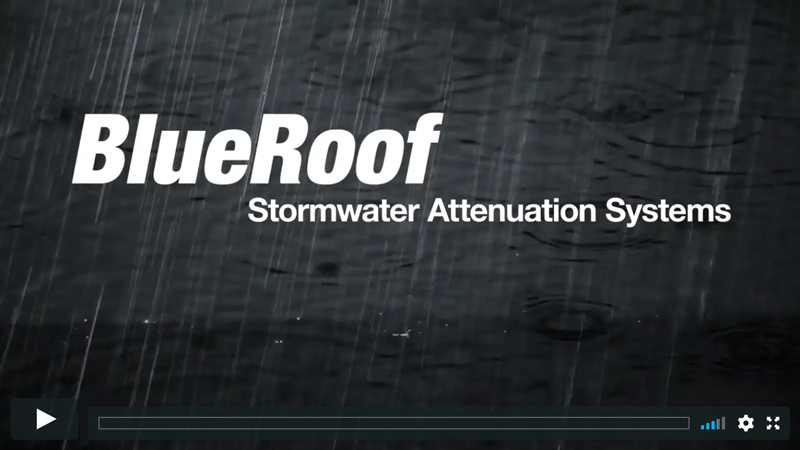 Used in conjunction with rainwater outlet restrictors to control discharge, the Blue Roof is designed to be half empty within 24 hours. 1. Install Radmat G12 Geotextile Filter Fleece over the roof surface and up all upstands, ensuring enough length is left around the installation for the G12 to wrap up the sides of the SWB Geocells, and enough to overlap a minimum 150mm onto the top of the SWB Geocells. 2. Lay SWB Blue Roof Geocells, clipping adjacent panels to each other using the SW Cross Connectors ensuring each SWB Blue Roof Geocell is correctly oriented for the clips to meet. 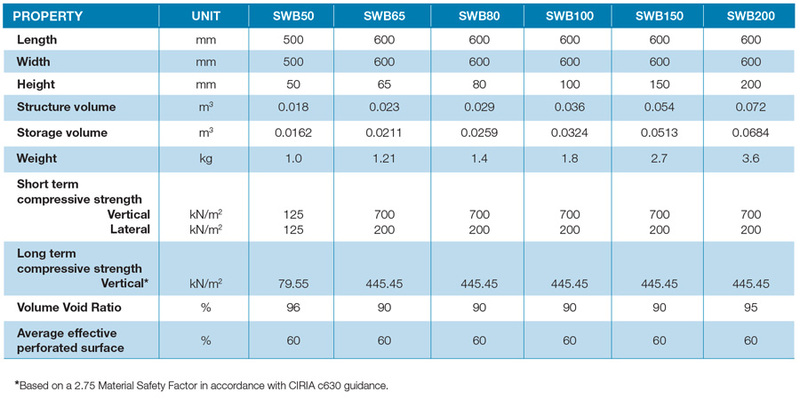 This is also the jointing method for a 2nd layer of SWB, SWG are connected with a shear connector. 3. Cover with Radmat G12 Geotextile Filter Fleece ensuring minimum 150mm overlaps. 4. Immediately cover with the specified roof finish (green roof/paviors/ballast).